Karen Renee Interior Design is a full-service, award winning firm specializing in Residential, Commercial and Model Home Merchandising in Annapolis and Severna Park, Maryland, Virginia, North Carolina and throughout the Midwest and Eastern United States. These single-family homes in Crownsville, Maryland, boast beautiful plans and ample room for even those downsizing (as in this case). With over 3,203 square feet plus the finished lower level which includes five bedrooms, designer Karen Osborne’s goal was for this Nantucket Craftsman design to have a setting that evoked a casual elegance with very natural and woodsy materials. The color scheme of the rooms was minimalistic, utilizing wood with metal, and beautiful shades of grey, white, and brown. 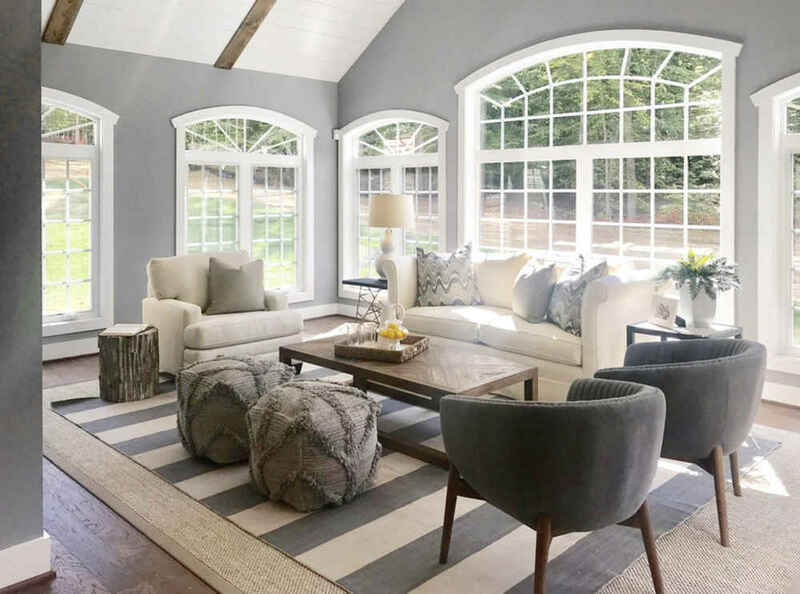 The stand-out room, the sunroom (pictured in photo), with its bright, airy windows and light, was painted in McCormick’s Techile (0533), which complemented the detail in the ceiling as well as the contrasting layering of the rugs, for a beautifully understated, neutral finish. Karen Renee Interior Design, Inc. Residential · Model Homes · Commercial · Severna Park Annapolis Maryland.